It’s so easy to connect someone these days with a quick text, tweet or email. But when you want to show genuine care and thoughtfulness to an acquaintance, new and old, sending a handwritten note is the obvious choice. As your virtual friends begin to become real friends, social media users want more ways to create more intimate connections with their peers. Social media fans are now embracing paper as a way to connect offline with friends and family in their network to make real relationships that can’t be done online. With tons of styles of customizable options, you too can embrace paper and make it socially your own. With personalized flat cards, notecards, and thank you cards, you can make this trend totally your own. Include your twitter handle, favorite hashtag, or create a mix of both to create a stationery suite to match your blog brand and its personality. 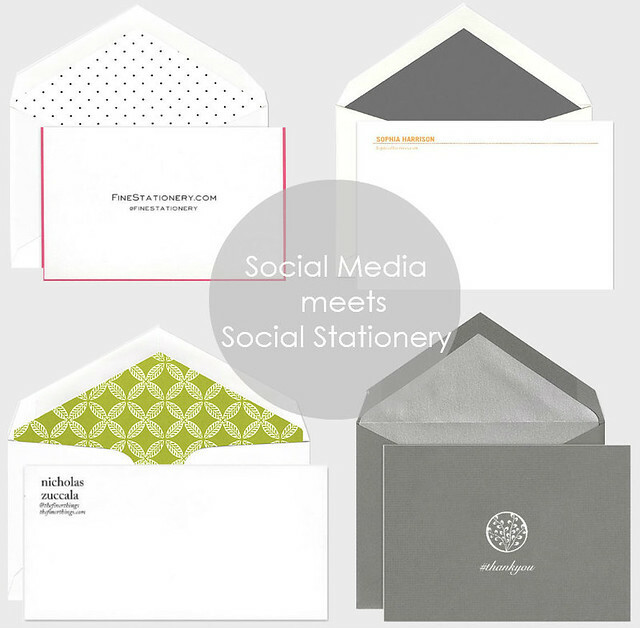 Twitter or Instagram Handle: If you are a social media user who loves to use your twitter or Instagram handle to reflect your personality, translate that love into fun social stationery. Many of the styles on our site can be customized to include the "@" sign as well as your twitter handle or Instagram name. You can use these cards to send thank you notes, congratulations to friends, and welcome to new followers or brands! Favorite Hashtags: If you prefer to use a trending hashtag of yours, make a fun stationery set for every occasion using fun phrases. They can be a simple #thankyou or #hellothere, or a little more creative and fun like #winning, #yolo, or any other phrase you love using! Blog URL: If you have a blog that you would like to include in your personal statement of your stationery suite, many designs can be personalized with your website URL so recipients know where to find you on the web! This is great to include in business stationery and blogger stationery. Are you an avid blogger? Leave your blog URL or social media URL of choice in the comments so we can follow!